It will be months before we know the full extent of Paul Manafort’s impact on the culture of Washington influence peddling. But as Manafort’s trial continues this week, this much is already clear: the former Trump aide’s legal woes have made the world of D.C. lobbyists who work for foreign governments slightly less murky. The Trump administration submitted its fiscal 2019 budget request to Capitol Hill on Monday, outlining the president’s priorities for the fiscal year that begins Oct. 1. During his first State of the Union address Tuesday night, President Donald Trump continued the nationalist theme he emphasized during his campaign, mentioning America or some variation 79 times. His other top mentions were the words “great” (26 times) and “tax” (15 times). Here’s a look at the topics that Trump covered and how his use of certain words compares to his previous major speeches as a president and a candidate, and to President Barack Obama’s final State of the Union in 2016. The state of the union is … nuanced. 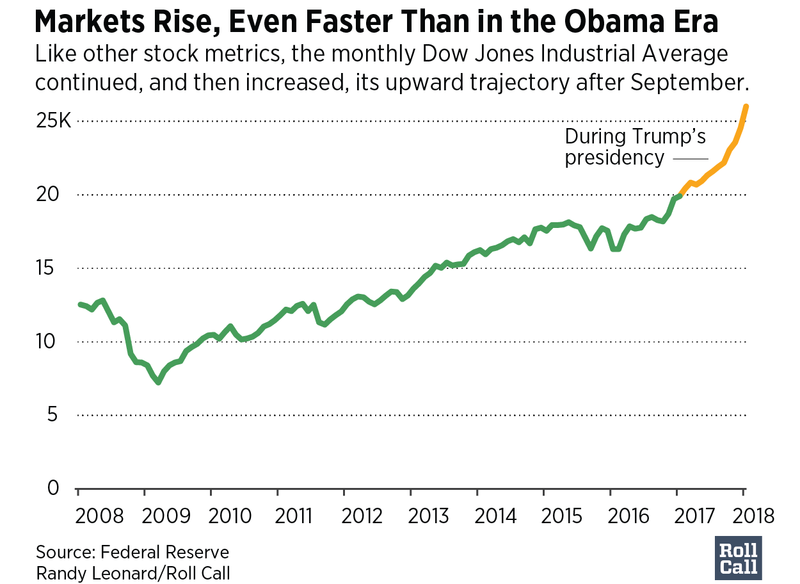 In President Donald Trump’s first year, the stock market continued to climb as unemployment fell. While the president will likely point to these accomplishments in Tuesday’s speech, the bigger picture suggests they are longer-term trends. Here’s a look at several slices of U.S. economic data and other indicators. Appropriators are not giving President Donald Trump the degree of overall cuts that he asked for in fiscal 2018 funding. The House passed a package of four titles last week and has cleared the remaining eight through full committee, while the Senate has cleared six titles through full committee. Appropriators are softening Trump’s cuts by more than $50 billion. Congressional maps in key battleground states such as Pennsylvania have shifted the political balance of Congress toward Republicans — but that could soon change. A GOP proposal to repeal and replace portions of the 2010 health care law is making its way though the House, but it faces an uncertain fate. Donald Trump’s picks for his Cabinet have less government experience and schooling than the first Cabinets of the past three presidents. Trump&apos;s skews older, much wealthier and has fewer minorities. In the early hours of Jan. 12, the Senate took the first step in the convoluted process of dismantling and replacing the 2010 health care law. To overcome the potential filibuster power of Senate Democrats, GOP lawmakers are relying on budget reconciliation, the same procedural mechanism their counterparts across the aisle used seven years ago to implement parts of the health care overhaul. The budget reconciliation process is filled with procedural complications — and in this case, political uncertainty — as GOP leaders and President-elect Donald Trump have signaled various ideas about the timing of changes. Could a #NeverTrump Republican really launch an independent campaign for president right now? Not a successful one, according to a Roll Call analysis of state filing deadlines for independents to get on the ballot across the U.S.
Evan McMullin, a longtime GOP Hill operative and former CIA officer, is planning a presidential campaign for those Republican loyalists distancing themselves from the party&apos;s nominee, Donald Trump. He&apos;s launched a website saying just that. As Roll Call&apos;s Alex Roarty reported on Wednesday , new candidates and disappointing nominees have changed expectations for 2016 Senate races since the start of the election season. No races have seen bigger shifts than the ones in Indiana and Florida, where the return of political stars Evan Bayh and Marco Rubio have turned each election on its head. Thinking Ahead: Who Could be the Next Woman to Lead a Ticket? Whether or not Hillary Clinton wins the presidency in November, her place in history as the first female nominated to lead a major party was cemented this week. Although the race is far from over, her success has added a new dynamic to presidential politics in the United States for both parties. What may not have been possible before, now is, and for many women on the rise, it&apos;s time to think bigger. Immigration policy has been a dominant topic on both convention stages these past two weeks. But what are the specific policy initiatives that are being debated? CQ Roll Call has a brief recap of what&apos;s happened to immigration policy on the House and Senate chamber floors in recent years.